Pauline telling stories at Darwin, Dinosaurs and Dodos at Aberdeen’s David Welch Winter Gardens. On Sunday the 5th April between 1 and 4pm, Anna Fancett and I ran a Family Storytelling workshop at Archaeolink. Based on an environmental theme, the workshop targeted children between primaries 4 and 7 but everyone was be made welcome! The workshop attracted a number of families and used seasonal items gathered outside, instruments and puppets to tell stories about the environment we live in! We had some great stories and are looking forward to doing it again some time soon! Along with the rest of the nation, storytellers have been celebrating Homecoming. One special event on the 16th May in the Lemon Tree saw Word, SC&T and GAS joining together for a ceilidh of stories and song. The event was lead by Stanley Robertson and Grace Banks and was a great success! Stanley and Pauline performing at the Lemon Tree event in May. Sadly, this was the last time I was to sing together with Stanley who passed away in August. I had been in Stanley’s SC&T Ballad Class for many months and enjoyed every minute learning from him. It is a memory I will treasure. The 20 minute show of evolution from Man to Molecules, is available for your event. Contact the creators through my details on the contact page. I had a HUGE amount of fun telling stories at the Glastonbury Festival of Performing Arts. The Glastonbury Festival 2009 was held from Wednesday 24th to Sunday 28th June and I was telling stories in the Earth Lodge in the Green Futures Field on Thurdsay, Friday, Saturday and Sunday along with Christine Willison who has been a regular at Glastonbury for many years, and other storytellers from the British Isles, Anne Lister and Cath Little. I was also telling daily to the kids of Glastonbury in the Kidz field Storytelling tent, ran by Storyteller John Row. Great fun! The Darwin/Evolution theme continued with a series of events in the David Welch Winter Gardens at the Duthie Park this summer organized by the Natural History Centre entitled “Darwin: Discovery, Dinosaurs and Dodos” All events were free and took place weekdays from Monday 13th July to Friday 31st July between 10am and 4pm. On Wednesday 15th, I told stories from Darwin’s various ports of call on his journey on the Beagle, and on Wednesday 22nd, to coincide with the week of Dinosaur events, I told stories about Scotland’s Monsters and Mythological Creatures! On the 2nd August, I was invited back to the Burn O Vat. Along the route to the Vat from the visitors centre, I told stories inspired by and related to some of the plants and wildlife found along the way. We covered the folklore of buttercups and daisies, heard how a girl saved her village from invaders, heard a good warning about faries and heard about some of the people from Dinnet’s history. We spent some time in the Vat itself hearing about Gilderoy McGregor and finished off with one of my favourite stories – that of the origin of the most terrible scourge of Scotland – the Midgie! 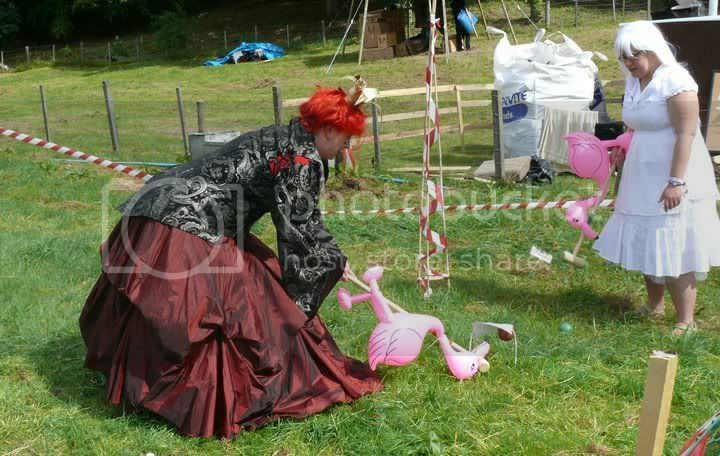 At the end of August, I was delighted to be telling stories at 2009’s Wizard Festival. Wizard Festival is now in its third year and (as well as one of my favourite bands!) will host the “Wee Wizards” arena for the second year – with HEAPS of things for kids to do. Although the weather delayed the festival for a couple of house (and we ended up pitching our tent in the tale end of a hurricane! 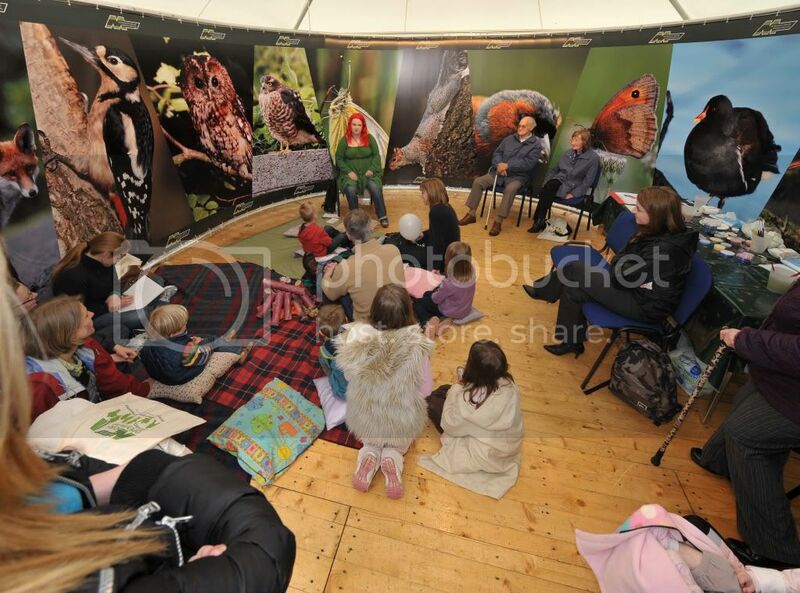 ), the tent was packed with kids and the storytelling was great fun. I’m already looking forward to next year’s festival! The next big event was Gadiefest 2009, a weekend of of Storytelling, Drama, Music, Ballads, Arts, Crafts and Poetry – I was very excited to be one of the organisers! The Grampian Association of Storytellers and Archaeolink Prehistory Park, both of which I have been involved with for many years, joined forces to present “Gadiefest 2009 – A Festival of Storytelling and Traditional Arts in the North East of Scotland.” We hope this will become an annual event and look forward to 2010. Click Here to visit the Gadiefest Web page! Although the weather wasn’t on our side this year, Wickerman at Archaeolink on the 25th October was very enjoyable! Members of the Grampian Association of Storytellers and Aberdeen University Storytelling Society were telling spooky tales in the round house and I was once again hosting the Haunted Caverns with help from members of Historic Saltire. This year we covered Sawney Bean, The Horseman’s Word, a ghost story from Blairs and the Plague in Aberdeen. I was back at Archaeolink on the 15th November to tell stories in the roundhouse for the 4th Experimental Archaeology Conference. And finally, I was invited to be guest storyteller at the Aberdeen University Storytelling Society on the 18th November – it’s always great to be invited along as I always have so much fun telling stories there!